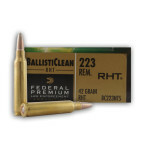 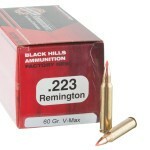 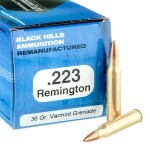 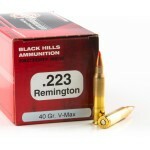 .223 Remington Ammunition is basically the civilian version of the military's 5.56x45 cartridge. 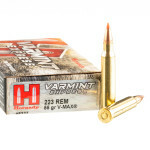 An excellent round for plinking, self-defense, or varmint hunting, AR-15 shooters love 223 ammo because it's largely available and provides very little recoil. 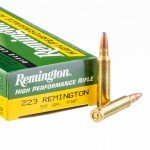 Fittingly, Remington developed the 223 Rem cartridge in 1964 to slide in between the smaller .222 Remington cartridge and the slightly larger .222 Remington Magnum round. 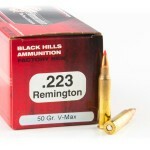 Once fired by the public, it was clear the benefits of this cartridge were highly valued and 223 Remington continues to be one of the most popular rounds available today. 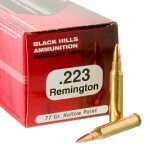 What Types of Bullets Are Common? 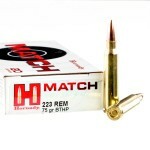 .223 bullets come primarily in FMJ (full metal jacket) and HP (hollow point). 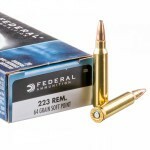 For range use, you’re likely to prefer FMJ rounds as these bullets are typically the cheapest ammo available and will reliable feed, fire, and punch holes in any piece of paper you can place down range. 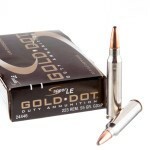 For hunting and defense situations, you will likely want to find a dependable hollow point or specialty round, like these rounds from Wolf. 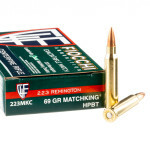 In both the case of FMJ and HP/JHP rounds, you can find bullets equipped with a boat tail that provides additional stability to the projectile while it soars toward your target. 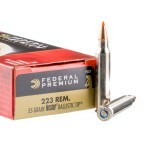 As far as bullet weight, we carry a huge variety of in-stock 55 grain (including M193) and 62 grain (including M855) loaded rifle cartridges. 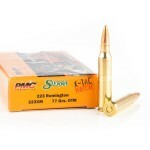 Additionally, you'll find some of the less popular fringe weights on both the higher and lower ends of the spectrum. 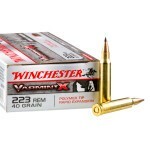 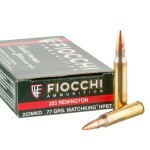 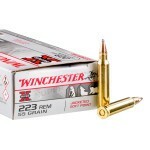 Look for 77 grain bullets and those as light as 35 grain for sale here on our site. 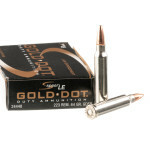 Hunters will likely also want to take note of other specialty bullets such as PSP (pointed soft point) and SP (soft point) that can give you increased performance in self-defense or hunting situations. 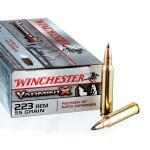 Winchester’s Ranger .223 ammunition is a good example of this type of specialty bullet. 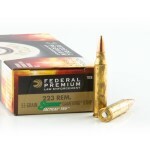 While there is some evidence that steel-cased rounds can cause more wear and tear on your rifle than brass-cased rounds, typically the price difference will make up for the cost of barrel replacement or maintenance. 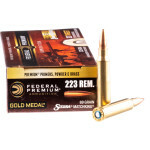 (Typically, steel cased rounds are cheaper than brass, which may allow you more time at the range for your money, even if you take into account replacement barrels and other expenses of that sort). 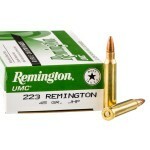 Are 223 and 5.56 Interchangeable? 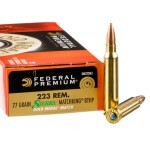 While similar, the two rounds aren’t the same and shouldn’t be treated as interchangeable. 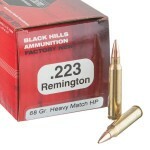 While you can safely fire .223 Remington Ammo from a firearm chambered in 5.56x45 NATO, it doesn’t work both ways. 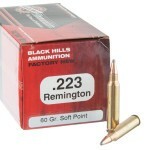 In other words, you shouldn’t fire 5.56 in your rifle if it is chambered for .223. 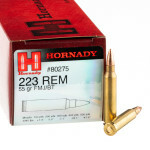 Basically, 5.56 is loaded at higher pressures than .223 and using the 5.56 in your AR-15 could lead to a catastrophic failure and serious injury. 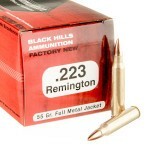 When it comes to plinking with you AR-15, most of us are looking for a reliably loading round that hits the mark consistently. 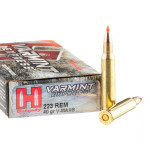 Check out the list below to see this week's best sellers in .223 Remington and step up to the firing line knowing you're loaded with rounds serious shooters can count on.